(Nanowerk News) Understanding how small organic ions stabilize gold nanoparticles may allow for better control. “The potential applications of gold nanoparticles could have a huge impact on society, and understanding stabilizers like citrate might be crucial to progress,” said Jean-Marie Basset, Director of the KAUST Catalysis Center and Distinguished Professor of Chemical Science, and a member of the research team, Professor Luigi Cavallo. 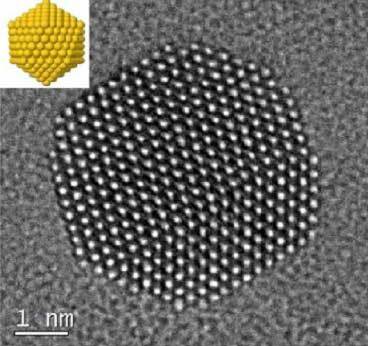 Along with colleagues at The University's Core Labs and coworkers in UK, Switzerland and France, the researchers have shown different ways that citrate ions can bind to gold atoms at the surface of nanoparticles (Nature Chemistry, "The structure and binding mode of citrate in the stabilization of gold nanoparticles"). They also discovered how to influence the binding mode by controlling the ratio of the nanoparticle/citrate ions. Different modes can influence the structures and properties of nanoparticles. “The experimental and theoretical characterization of these systems is challenging due to the flexible nature of the interaction between citrate and gold,” said Basset. He explained that collaboration between KAUST teams was essential for meeting the challenges, allowing creation of the stabilized nanoparticles and their analysis and imaging at high resolution (see image).